Thousands Of South Koreans Join Suit Against Apple Over Location Tracking : The Two-Way In July, a South Korean court awarded $932 in damages to a man who sued Apple over the iPhone's ability to track users' location — and store the data for up to a year. Now, around 27,000 South Koreans are making the same complaint, and seeking the same award. The law firm handling a new suit seeking damages for Apple's location tracking gathered plaintiffs at a website called"sue apple," seen here in a screengrab. In July, a South Korean court awarded $932 in damages to a man who sued Apple over the iPhone's ability to track users' location — and store the data for up to a year. Now, around 27,000 South Koreans are making the same complaint, and seeking the same award. If Apple loses in court, it may have to pay a total of $25.7 million, to match the original judgment of 1 million Korean won in damages for each plaintiff. 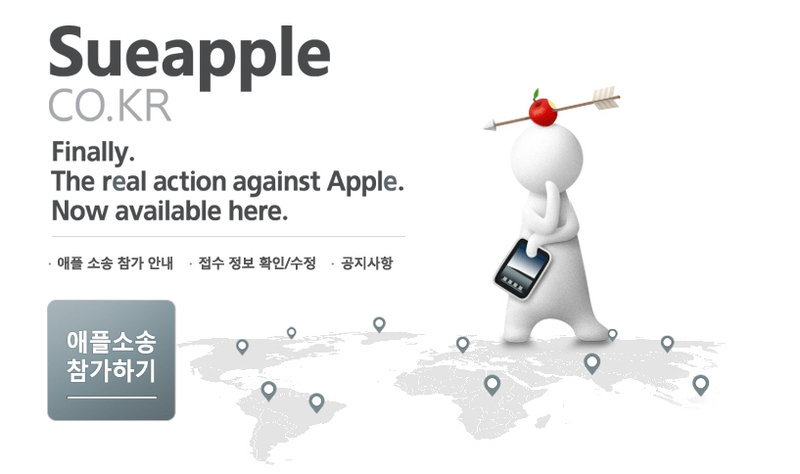 The plaintiffs joined the lawsuit by registering at a specially created website: sueapple.co.kr. Incorporating elements of Apple's clean, minimalist design aesthetic, the site uses the slogan, "Finally. The real action against Apple. Now available here." The website was set up by the law firm Miraelaw, according to the Korea Times. The firm also employs the plaintiff in the original winning lawsuit, attorney Kim Hyeong-seok. The large lawsuit followed revelations earlier this year that Apple's mobile devices were logging location data — and that users' attempts to disable the monitoring were often frustrated by the device's software, which switched to recording nearby cell-service antenna locations, if the user had disabled the phone's GPS option. As the L.A. Times' Technology blog reports, "Some iPhone and iPad owners have demonstrated that they can use the location data stored on their devices to create a map of their travels." After a request was extended by the AP, Apple spokesman Steve Park in Seoul declined to comment on the new lawsuit. The Korea Times reports that more than 3 million iPhones have been sold in South Korea. Court officials in South Korea say that the case is likely to take some time to resolve,.